The battle between two age-old enemies just got tougher. 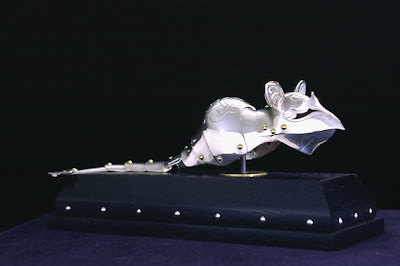 Canadian artist Jeff de Boer has created specially designed suits of armor for both mice and their deadly foes--cats. Boy do I wish I had some pets right now. How hilarious would it be to have your cat wandering around in a full set of armor? 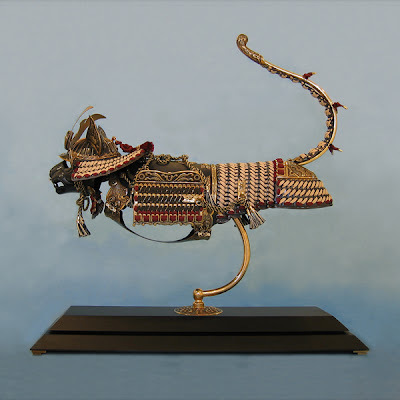 Check out more pictures (and learn how to make a Samurai Cat) here. Um...I think you may have forgotten to put the link up! i still have not gotten my copy of kiki strike in rution. ask if you needcontact my before you send it. I WANT ONE!!! oh man my friend has a mouse and i am SO getting him one of these! I like the mouse armor better that the sat armor. It just seems more...fantasy-ish. Let's hope the rats of the Shadow City don't get their hands on those! I'm surprised it isn't cats and dogs. Those are pretty dang cool. I always wished i knew how to sword fight. Wouldn't that be cool, a little pirates of the caribbean action there. righto. kay, i gotta go, i don't have anything interesting to say. 've been robbed of my my wonderful abnormal mind. wahhhhhhhh. Sameanonymous: Why does your teacher refuse to read it? IM: Great point! I hadn't thought of that. Great find, those are awesome. I'd be afraid to kit out cat out, though, she already rules the house, she'd probably take over the world and humanity would be relegated to a supporting role involving rodent breeding, dairy gathering, and toast making (yes, she likes toast...a lot). Today's just been a great day for art altogether. Check out this from the BBC... the top one has reignited my desire to go on some kind of steampunk airship trip (tomorrow's reading list: The Twenty-one Balloons, The Big Chunk of Ice, The Airship Ladyship Adventure, and a large amount of Jules Verne). Gamma, can you tell me how you put in that link? Because whenever I put in links they run of the edge of the page and then nobody can use them. Wow! i need one! maybe they would inspire my dwarf hamsters to move instead of sleeping all the time! ANANKA:he said it was because it wasn't aperoved!!!!!!!!! Same Anonymous: Tell him it was a 2007 ALA Best Book for Young Adults and a 2007 IRA Children’s Book Award Notable Book! i told my english teacher last yr 2 read it and she loved it! she might even read the 1st book this year as a class assignment. isnt that cool? Make sure you only change the things that are in capitals (for example, you need to leave the ""s in for it to work), and make sure you use the full address, like http://www.google.com/ instead of just google.com . Oh and use preview to make sure it works right! Thank you very much! I'm copying that into Notepad right now!